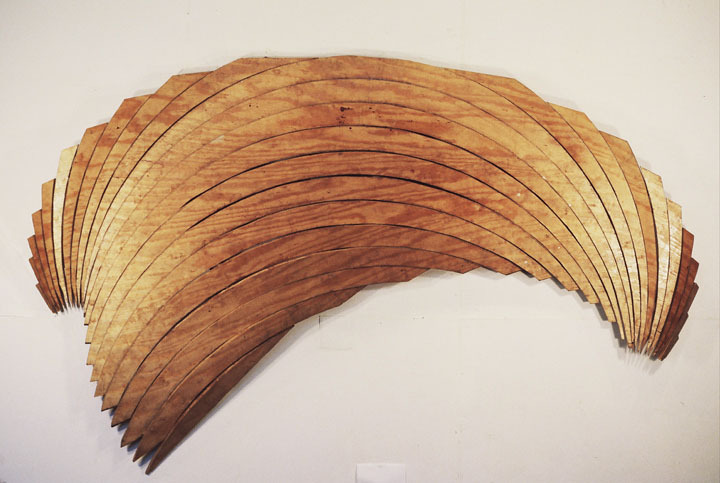 A found 4’x8’ sheet of plywood was cut in arcs of the same degree with each released piece rotated three inches to the left and reassembled. The right side was rotated 3” to the right. A framework was constructed on the back which allowed the surface to “ungulate.” Net loss: 2 pounds of sawdust. The piece was exhibited at the inauguration of the new St. Louis Convention Center. H: 6 ft. 3 in. x W: 9 ft. 8 in. x D: 12 in.